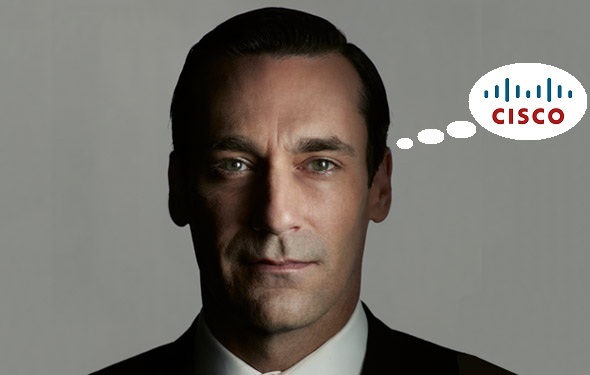 Mad Men is finally back. After a year or so of patiently enduring many bourbon-less nights filled with smoke-free air, our favorite vicarious vices return, along with the seemingly elegant yet despicable characters who perform them. This season, number six, we’re poised to get to know Don Draper even better, after sitting through several recent episodes that lacked flashbacks or insight into the past of the man behind the Madison Ave machine. There are few things we can be sure of when it comes to Mr. Draper, but one thing we’re certain of is this: the man can make one hell of a pitch. So, in today’s even faster-paced world of marketing and more rapidly-changing consumer culture, what would Don do with routers and switches? How would he market such items in the concise, poetic manner we, along with the show’s clients, so often wait with bated breath to hear? It can be tricky to speak eloquently and nostalgically of something as dry and technical as IT hardware (believe me, it’s one of my daily hurdles). How would Don present a Cisco Adaptive Security Appliance in a way that emotionally resonates with its intended audience? Better yet, how would he promote the modern secondary market and companies like planIT HARDWARE? Technology can connect us, or separate us. Don seems to think, at least in this episode, that the technological innovation of that time, the Carousel slide projector, is best marketed with a hefty dash of nostalgia: we seem to make technology with the express purpose of moving forward, but we often end up utilizing it the most to go backward, to save endless files and photos and songs so that we may willfully and flawlessly recall them to memory—and not only to remember them, but to experience them all over again. This entry was posted in IT Hardware, IT News and tagged adaptive security appliance, asa, cisco, cisco asa, IT marketing, IT News, mad men, mad men nostalgia, mad men premiere, mad men season 6, technological innovation. Bookmark the permalink.